A CVS store is pictured in 2015 in San Francisco. CVS Health is reportedly preparing to purchase Aetna for $69 billion. CVS is preparing to buy the health insurance giant Aetna for $69 billion, the companies say. The acquisition, which has been reportedly in talks for months, would be one of the largest such mergers in the history of health care. 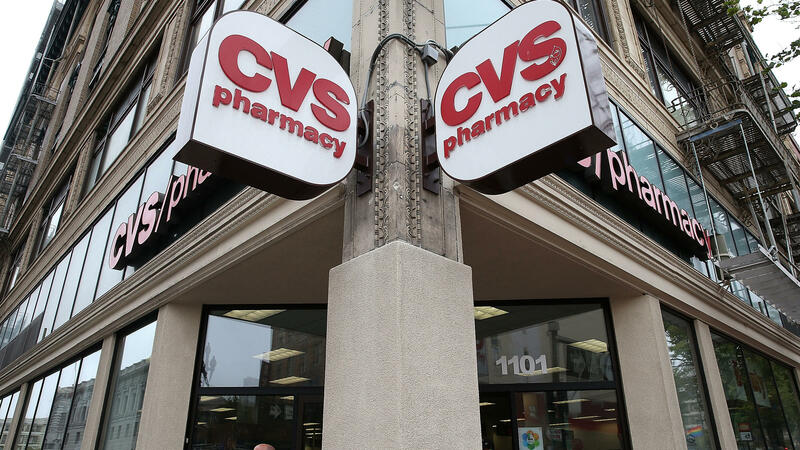 It would combine CVS Health Corp, which has more than 9,000 pharmacy stores and more than 1,000 walk-in clinics, with an insurance company that covers more than 22 million members. The companies say, "This transaction fills an unmet need in the current health care system and presents a unique opportunity to redefine access to high-quality care in lower cost, local settings — whether in the community, at home, or through digital tools." In October, Amanda Starc, associate professor of strategy at Northwestern's Kellogg School of Management, spoke with NPR about the implications of any deal between CVS and Aetna. She noted that CVS is not just "the drugstore on the corner." "In practice, CVS provides a lot of drug insurance through something called a pharmacy benefits manager," Starc says. Large national insurers like Blue Cross Blue Shield already contract with CVS for their pharmacy benefits. In fact, that program accounts for "the majority of their revenue," Starc says. "So while you might think of them as the drugstore, they're ultimately a big insurance company." Buying Aetna will make CVS even more of an insurance company, instead of a retail pharmacy, she says. "It will allow them to have a large, captive audience for that insurance arm, and that might allow them to do a couple of things. They might be able to negotiate lower drug prices from manufacturers by virtue of their sheer size," Starc says, while noting that doesn't necessarily mean lower prices for consumers. "They might also be able to better align your pharmacy benefits and your health care benefits," she says. For instance, an integrated insurer could "provide pharmacy benefits to incentivize you to do things like fill your blood pressure pills so that you don't end up in the hospital." As The Wall Street Journal previously noted, and The New York Times and Bloomberg emphasize today, Amazon is one motivation for CVS to buy Aetna. The web-based behemoth, which has shaken up so many industries, is now eyeing the pharmacy business, prompting companies like CVS to worry about their future. The Wall Street Journal notes that Aetna also faces challenges of its own — "A judge's decision led Aetna earlier this year to give up its planned acquisition of Humana Inc. and [Aetna] has retreated from the unprofitable Affordable Care Act exchange business, leaving it with an unclear path to future growth, analysts say. It also lacks the diversity of larger rival UnitedHealth Group Inc., which has a fast-expanding health-services arm that includes a pharmacy-benefits manager as well as doctor practices and surgery centers."